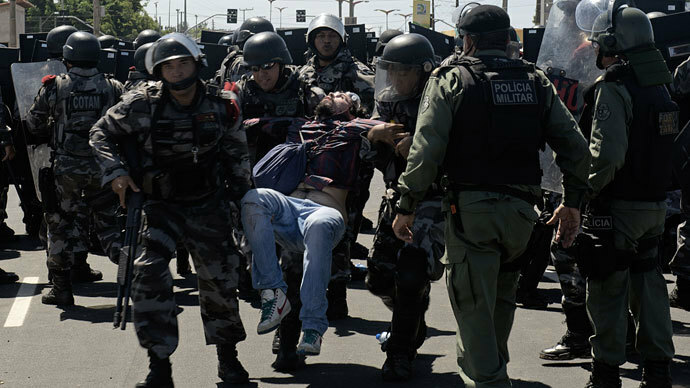 Violent clashes have erupted in the northern city of Fortaleza in the hours leading to a Confederations Cup match with Mexico. Dozens were hurt as riot police unleashed tear gas and barrage of rubber bullets at a crowd of some 30,000 Brazilian protesters. Images and video of the demonstration just outside of the north-eastern city depicted throngs of protesters marching down a road towards the stadium hosting Wednesday’s match. One person was reported to have suffered an eye injury and another was taken away on a stretcher. 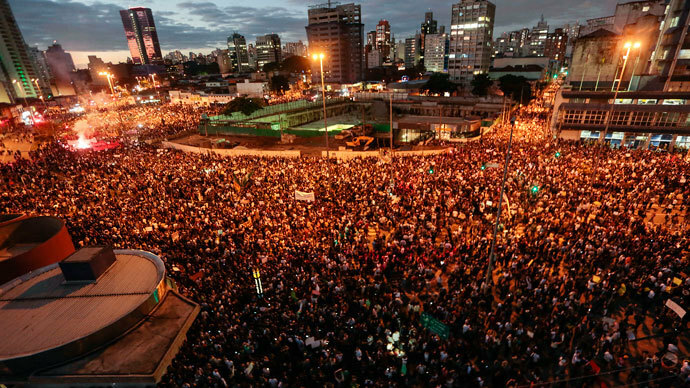 The protesters were marching against government spending on the World Cup and the Olympics. During the Fortaleza protest, demonstrators carried banners reading "a teacher is worth more than Neymar," a reference to one of Brazil's star players slated to appear in Wednesday’s game. Despite some rhetoric targeting players, in addition to FIFA, the global football governing body, Brazil’s national team players expressed solidarity with demonstrators. "After seeing the people on the streets claiming for improvements, it makes me feel like joining them," striker “Hulk” (Givanildo Vieira de Souza) was quoted as saying by the Associated Press. 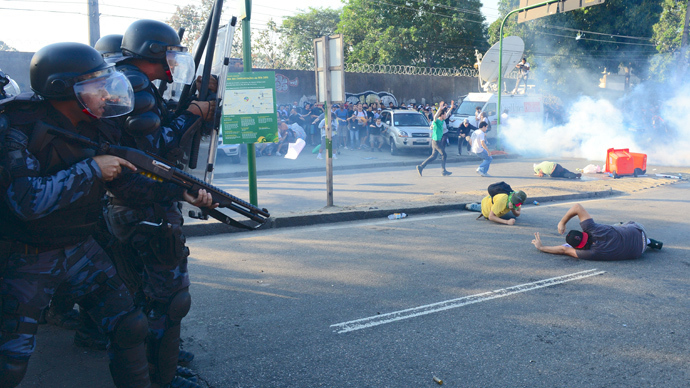 The Confederations Cup, which is still underway, had the misfortune of beginning in tandem with planned hikes for public transportation fares, which were the catalyst for demonstrations nationwide. The fact that vast sums were spent on new stadiums and the refurbishment of existing venues ahead of the World Cup in Brazil, while many in the country still live in poverty, is seen by many as a symptom of their government’s ineptitude. As the world’s football governing body and organizer of the World Cup, FIFA has found itself in the delicate position of having to acknowledge public discontentment in the country, while still protecting the interests of the massively popular and extremely lucrative sport. Brazil's government had warned that it would deploy the National Public Security Force, the country’s national guard, in the five cities hosting the Confederations Cup: Rio de Janeiro, Belo Horizonte, Salvador, Fortaleza and the capital Brasilia. 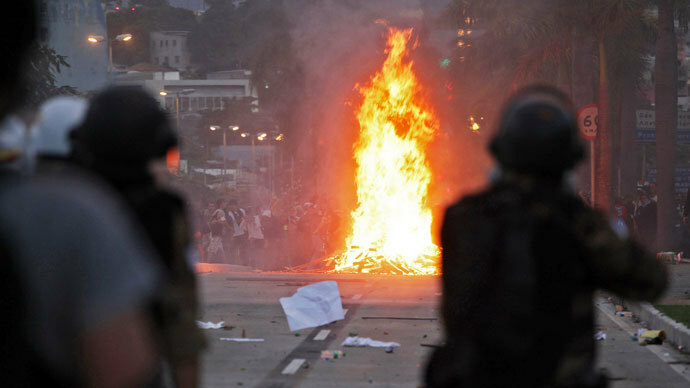 On Tuesday the mayors of Cuiaba, Recife, Joao Pessoa and other cities had already announced a reduction in bus fares in response to this week's protests. On Wednesday, the municipalities of Sao Paulo, the country’s largest city, along with Rio de Janeiro were prepared to follow suit and also cancel proposed fare hikes.